OUR NEW TREASURER BOB SHAYLER ANNOUNCED “WE ARE GOING DIGITAL.” BOB ALSO THANKED CHARLES, KEVIN AND JIM FOR HELPING HIM IN TRANSITION. 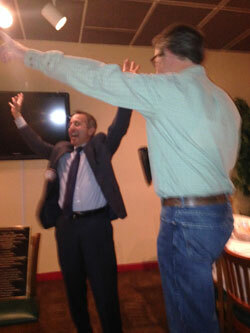 President John Aufdermauer brought down the gavel at Don Jose’s in Castro Valley, and asked one of our members (?) to lead us in the Pledge of Allegiance. VISITORS - John Courtney from San Ramon Rotary who will be transferring to CV Rotary! HELLO SONG - Kern Lewis stood in for Mr. Tedesco the best he could! FOUNDATION REPORT FROM DWIGHT PERRY - If you have not already contributed to the Rotary Foundation, please do so soon . . . all but 5-6 have contributed . . . sustainer is $100, double sustainer is $200 . . . contribute what you can so we can be 100% participation . . . thanks! Please keep Mr. Short, Mr. Smith and Mr. Tedesco (and their Brides) in your thoughts and prayers . . . fighting the good fight against physical challenges . . .
TEXAS HOLD’EM POKER TOURNAMENT - March 22 - Masonic Lodge - 5 PM Dinner and 6 PM Tournament - Al West has started his search for prizes by drafting Randy Vanderbilt again this year! $200 buy-in . . . sign-ups to follow along with more details . . .
PANCAKE PUTT-PUTT - April 5 - Golfland - sponsors and players will be needed . . .
CHILI COOK-OFF - May 9 - Rowell Ranch Rodeo Grounds - first meeting is January 30, 5:30pm, Don Jose’s. Prizes are $500, $200 and $100. ROWELL RANCH RODEO PARADE - May 10 - Rowell Ranch Rodeo Parade - Theme “Castro Valley Rocks!” Co-Chair TL Baily confirmed that we WILL have the Wells Fargo Stagecoach this year! Next committee meeting is Wednesday noon, February 12 in offices behind Wells Fargo Bank in CV. REPEAT - The RotarAct of Central Alameda County WAS collecting 4000 toothbrushes for a ministry trip overseas in March . . . Jim Negri brought 1000 by himself so now “our” goal is 2000 toothbrushes by March per our President John! Please bring new toothbrushes to an upcoming Rotary Club Meeting! $71 Dwight Perry (birthday) - there was a pre-meeting party . . . balloons and the works! PROGRAM - Today our program was a Club Assembly with reports from the various committees and talking about the future. Lots of vision casting and excitement. We are looking at a couple of international projects (possibly Honduras and Ethiopia?) plus local projects like repairing and replacing posts for the fence around Banyon House, one of the FESCO properties. 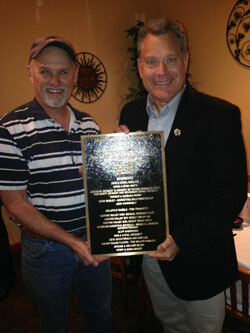 Exciting times to be a member of the Castro Valley Rotary Club!